When a hive dies, thousands of bees … sometimes as many as 50,000 or more … pass away. Across my years of beekeeping, it could be said that I have only lost 30% of my hives and that statistic is not uncommon. But I don’t think of my honeybees as so many numbers. They are family and the loss of family is a deeply felt thing. I am an aural beekeeper. 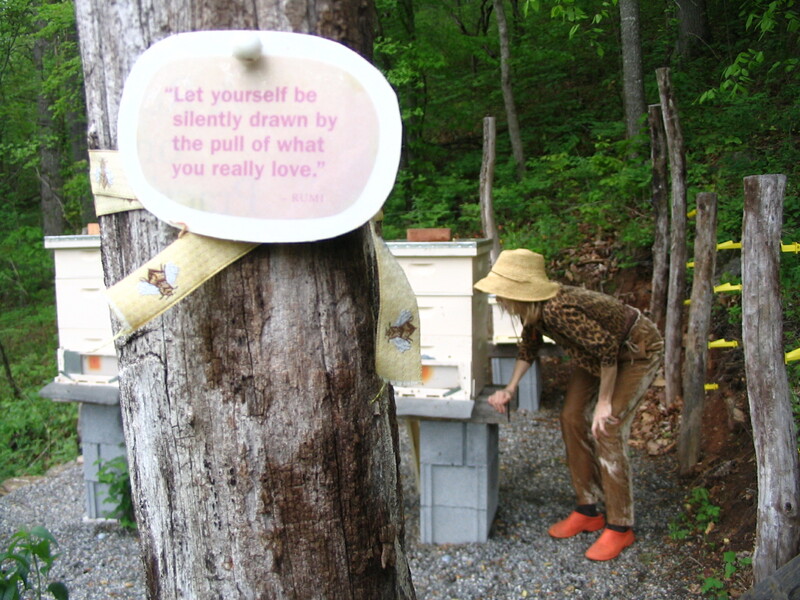 I put my ear to the side of each hive daily and listen. I wish them well and tell them I love them with all my heart. I can identify a dozen versions of contented sounds and just as many ways of expressing disturbance. And none of my hives are the exact same pitch. A hive is thousands of individuals and a hive is also one entity, a collective that Jurgen Tautz calls a superorganism. When bees die and that collective is no more, the silence is a loud, unholy, heart breaking stillness. DESCANSO ... in Kaylynn’s studio outside Taos, NM. The loss of life in my bee yard this winter was staggering. Some hives died from the disease / fungus Nosema ceranae and others died from causes still unknown. My strongest colony disappeared in the heart of winter, abandoning brood (the various stages of young bees-to-be). Bees don’t abandon their young and they don’t leave home in the cold. 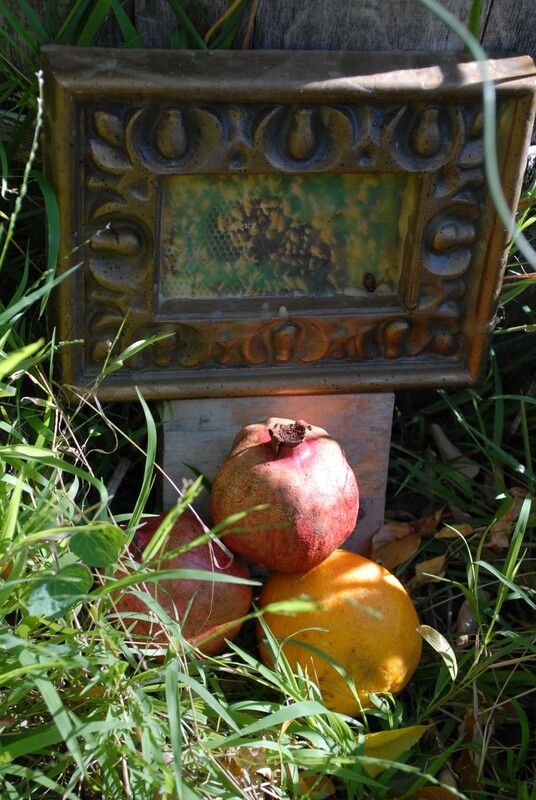 And so I have honored my dead through grieving and in this season of loss, have also been blessed and uplifted by Descansos, the sacred bee-honoring shrines created by my friend Kaylynn Sullivan TwoTrees. 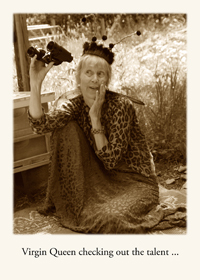 Kaylynn is an artist, elder, visionary, and beloved friend who lives in New Mexico. Her wisdom weaves through my life like some bee-ish fabric that leaves silk breathless (and even envious). She is one of the great loves of my life. 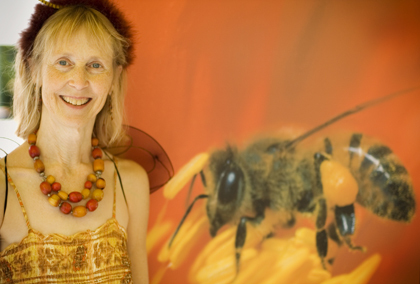 Some years ago, she began a body of evolving work called Descansos for the Bees, which she defines in this way: A Descanso is a Spanish word meaning rest or resting place. This word today is used to describe the memorial marker found along most high ways in the U.S. A Descanso is usually erected at the site of a tragic accident in which someone’s life was cut short. 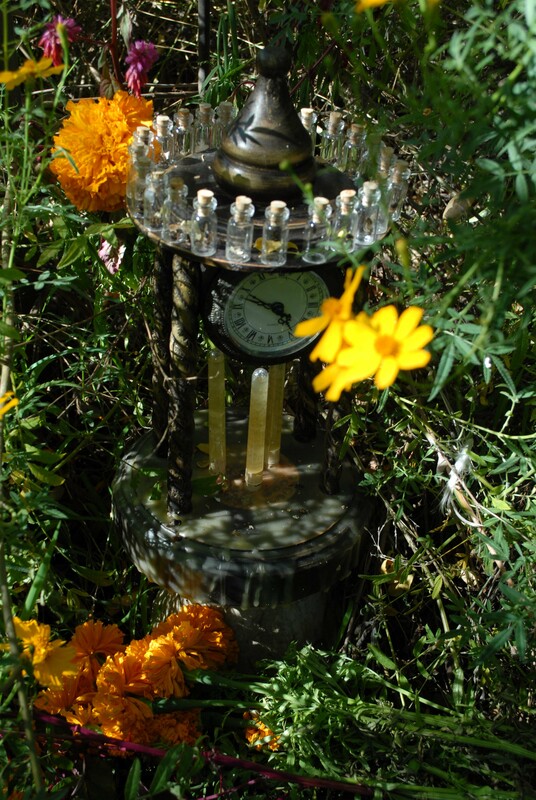 These Descansos are part of a series of resting places / memorials to commemorate the tragic accidents of the loss of our honeybees. They are created from artifacts and interpreted residue from encounters with bees, beekeepers and bee yards around the country as a contemplation / celebration of the regenerators of the landscape and to mourn the continuing disappearance of our pollinators. In 2009, when I lost my first hives, Kaylynn asked for some of the bodies. I mailed her a package of their tiny precious forms and also extended the invitation to some of my community here in western NC. We sent bees, queens, pieces of wax comb, and residue from the bottom boards. And unasked, our circle sent these items wrapped in red cloth, a grandmother’s hankie, and tucked in parcels with sage. We sent our stories and shared our losses. And our bees became part of Kaylynn’s first honeybee-inspired Descanso, called Nature’s Lucid Dreaming, at the Avery Museum in Charleston, SC. 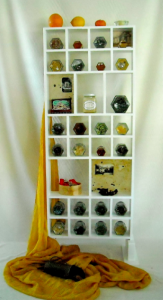 This mixed media installation was part of the Tasting Cultures: The Art of African / American Foodways exhibition, curated by the incomparable Sarah Kahn, Founder of Tasting Cultures Foundation and her husband Henry Drewal. Joe and I drove to South Carolina and attended that show. 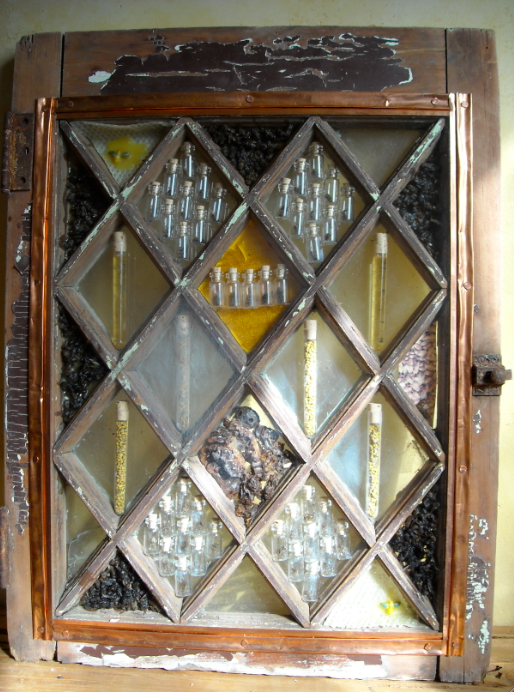 When I walked into the room featuring Nature’s Lucid Dreaming, I was first greeted by the sound of my bees, which had been recorded for the installation. And then I saw the bodies of my bees and some of the bees from my community. 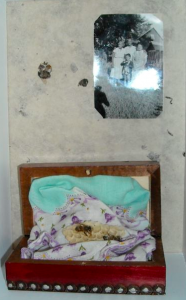 I saw the precious things we had shrouded our bees in, there beside small six-sided vessels, pictures of Kaylynn’s family, and handmade paper crafted from plants pollinated by bees. I witnessed a deep and personal honoring of the departed. And I wept. For me, Kaylynn had created an exquisite wailing wall and a monument to my winged family. I was undone. And in the curious way that pure grieving can surprise us, my tender bee-stewarding heart was also renewed and restored, the way that prayer can restore. Nature’s Lucid Dreaming was a powerful living prayer. Kaylynn’s work has continued to unfold over the years. Some of the Descansos are a permanent installation in Signal Street Garden, courtesy of her good friend Linda O’Toole in Ojai, California. 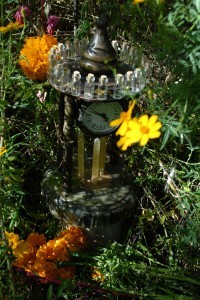 Another piece is in Kaylynn’s studio outside Taos, NM. And two Descansos are currently part of the Tasting Cultures: The Arts of Latino Foodways exhibit in Milwaukee (thanks again to Sarah Khan who is a great good force of nature). For those of you who live in this area, check it out. The show is up through July 21. Descansos continues its life as Kaylynn follows the call. She invites more donations of bees, hive residue, and also and especially, the bodies of queens. One special shrine has a special need of those. I wish, really, that I never had a single bee to send her. But such is beekeeping life in the modern world. If you are moved to contribute, please go to the Holy Bee Press Facebook page and check the Events section in the left hand margin. All the information is there. And if you are not a Face Book-ian, you can email Kaylynn for more details at: ktwotrees@gmail.com. You will be credited for your contribution and cherished … and you and your bees will become part of what she calls her hive of remembering. I love the sense of community with this item. I too feel the presence of the bees, and have pictures on my facebook page of my ears against the hives. When a hive dies, there is tremendous grief for me. I now do a ceremony for the death of the hive. A memorial is such an thing of honor and recognition for these lovely beings that grace my life. 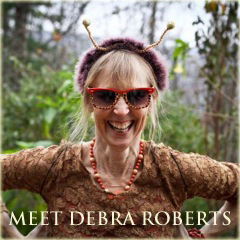 Thank You so very much Debra! I love what you are doing here. I’m attempting to put my FB profile up here for you. The pics should be under mobile uploads. Anyone that is a friend of the bees is a friend of mine, so dear readers please feel free to bee friend me on facebook as well! Blessings to you and thank you for listening to the girls! Cassandra, Hi. I just put a friend request out to you on FB. I look forward to meeting you by way of your photos. Love to see you listening to your bees. Oh My God! Just reading this made me love bees n love life and love loving!!! And although it was just a quick skim…. i feel softer and slower and better…. Thank you oh Holy Bee…. 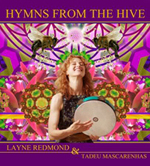 cuz I am seeing and feeling and experiencing, the Holy in the BEE! You guys (being Debra and Cassandra)….must be kindred spirits of these bees… and I… am loving the image of ‘energy’s connecting’… bee…. and human/bee-eing…. Wow hu!! Am saying this to myself! Not what i should be doing now… but had to say thank you for such heart touching sharing. Oh Myra Kruzer you have clearly been touched by the bees! What a blessing you are …. Thank you so much for this truly lovely message …. Debra- great page! I met you at Laurie’s honey tasting- hope your hives are doing well. Danny, thanks so much. And yes, I remember you from that glorious honey-infused evening! Yes, having the best bee year ever. And with you? Thank you so much Kacey.